Today, HTC and Facebook unveiled the HTC First. 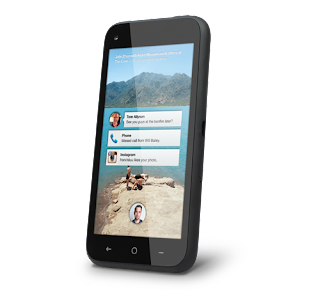 At a Facebook hosted event HTC unveiled the HTC First, the first phone to ship Facebook's newly announced Facebook Home. The homescreen replacement looks to put your Facebook friends at the center of your smartphone experience rather than the apps on it. Specs are in line with what was expected with a 4.3-inch 720p Display, a Dual Core 1.4GHz Qualcomm Snapdragon 400 processor, 1GB of RAM, a 5MP camera and LTE Connectivity. No word on Canadian availability, but we fully expect at least one major Canadian carrier to pickup the phone or even more likely one of the budget carriers who's demographic might be more geared to heavy Facebook users.